We’re excited that 19-year-old Zach Mengel has joined our Access Church staff. When he came on board this past summer, he jumped into helping with Waumba Land (preschool), UpStreet (elementary), and InsideOut (high school) and assisting Lead Pastor Rich Barrett. Zach was invited by a friend to visit Access, and he attended for the first time in August 2015, at the start of his senior year in high school. The second time he visited, his friend was unable to attend, and Zach went alone. The week after that, he brought his mom. From there, Zach has regularly attended Access Church and said he loves it. Zach met Rich the first week he attended Access, and the second week when he returned, Rich remembered his name. To Zach, this set Access and its leadership apart from other churches. Zach has grown up in Jacksonville. In his earliest years, he attended church with his family. Zach’s dad passed away from multiple myeloma, a white-blood-cell cancer that affects bone marrow and the immune system, when he was 3 years old. This tragedy left Zach’s mother to raise four sons, Zach being the youngest, without their father. After his father’s death, it became hard for the family to continue attending their church, so they started attending a different church when Zach was 5. Zach was very involved there. He began attending youth group in the sixth grade and transitioned into becoming a small-group leader his sophomore year in high school for a group of middle-school students. 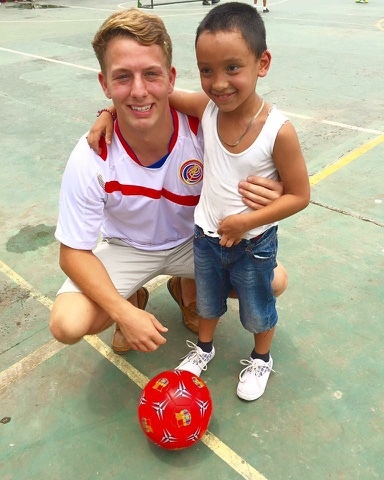 He also spent time in Costa Rica each summer with the youth group. It was during his junior-year trip to Costa Rica that he began feeling as though he was missing something in his relationship with God. “I didn’t feel any special connection with God that I had felt in past years during that trip,” Zach said. “I was really bummed out the whole trip and didn’t really know why or what it was that I was feeling.” This is what led Zach to try a different kind of church. Zach recently left Jacksonville for his second semester at Florida State University in Tallahassee. He has not decided on his major yet, but looks forward to following whatever path God lays out for him. Zach will return to work at Access this summer with an emphasis on leading a new program called Camp 95. “The idea of Camp 95 is that it’s any easy way to invite families to church while creating a fun and relaxed environment for kids to get plugged in and stay connected,” Zach said. Happy to have Zach on the leadership team @ Access!